An “Out Of This World” elite supercar key will appear at the fourth Amex World Luxury Expo in Riyadh. Senturion (also official partner of the Lotus F1 Team) have created a Senturion supercar key which is in fact a high technology device or bracelet made from meteorite deposits. At its core the Senturion Meteorite contains a Widmanstätten etch pattern (these are fine, interweaving bands of metallic elements) lifted from iron meteorite deposits. And while there are 500 iterations of the bracelet being made, the etching on each bracelet is unique. The main purpose of this bracelet is that it is embedded with RFID technology that enables you to use this as a wireless entry system capable of syncing with the locks in your house, personal jewellery vault and of course your supercar. However it’s not just about the tech spec: every bracelet passes through seven stages of craftsmanship and machine production, and also comes in palladium. 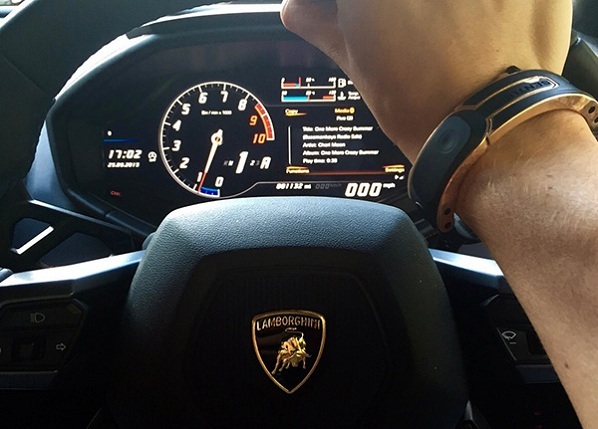 The Senturion bracelet will be on a fully functioning display with a Lamborghini showcasing the wireless entry systems and how this interaction works. The device is the type of high-tech and cutting edge instrument that one would expect from James Bond 007 and can be synchronised with leading supercars and luxury vehicles. American Express has announced that they have extended their sponsorship of the World Luxury Expo, Riyadh for an additional three years. World Luxury Expo is returning to the luxurious Ritz-Carlton Hotel, Riyadh from March 30th-April 1st, 2016. This is the fourth edition of the highly anticipated three-day event being titled sponsored exclusively by American Express. The exhibition will showcase carefully selected luxury brands and services, from an impressive range of luxury categories, appealing to a highly discerning guest list. The event is strictly by invitation and VIP guests can expect to see subtle improvements as the organisers continue to refine the overall visitor experience and hospitality, both hallmarks of the American Express World Luxury Expo. Those looking to attend AMEX World Luxury Expo can request an invitation and pre-register online, here. Following the event in Riyadh, World Luxury Expo will continue to Seoul in September 2016 continuing an on-going annual signature series of events.